I found some lovely Autumnal pieces yesterday, I had been looking for a light jacket and some accessories and it's like H&M answered my prayers. I'm so in love with this contrasting jacket, initially i wanted it in all black but once worn it lost the impact so opted for the pale grey shade instead. It fits perfectly and is a little different and definitely one to check out. I'm definitely an accessories person and these were just my cup of tea. I have wanted a massive floppy wool hat forever and so happy I found one for a bargain, it fits perfectly and I'm sure you will see an Instagram shot of me sporting it. The braided headband will be ideal to disguise mummy hair and hopefully still look somewhat cool. The black cap again will come in handy when I don't have time to do my hair. Do you see a pattern emerging? Well, I haven't worn a cap in forever and figured plain black will be acceptable. Roll on hat days! 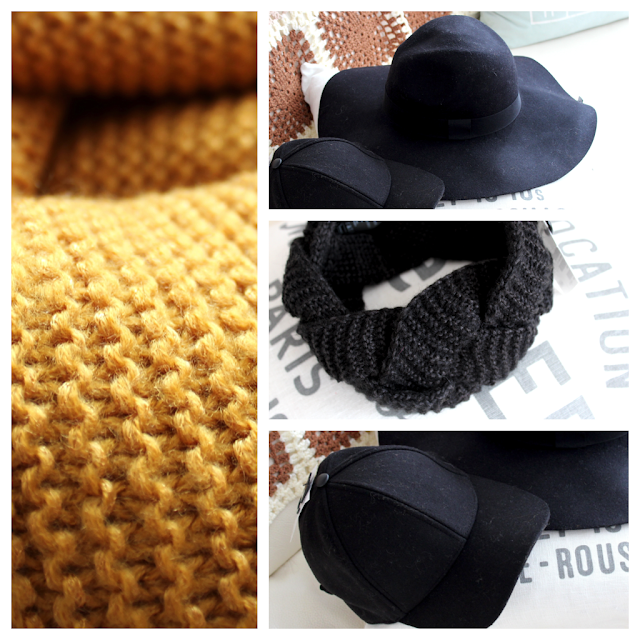 I love mustard for Autumn and couldn't bypass this gorgeous snood! What have you picked up from H&M lately? Nice jacket! I bought a cream colored fuzzy cardigan. H&M has some great finds at the moment. Ooh I'm loving all of your picks, especially that mustard colour - definitely my go to autumn colour along with burgundy! I'd really gone off H&M recently but I am defiantly tempted by the jacket. Really love it! You got. an awesome Style.. the yellow scarf is so cool! Love it. I am only starring your jacket, simple looking awesome post,looking great, i hope we follow each other. Your pictures are so clear and the lighting is always so nice. What camera do you have?! Oh and you're gorgeous btw!